For the Coconut Cream Poke Cake I used Duncan Hines white cake mix, 2 backyard jumbo eggs, 3 TBS sour cream, 3 TBS oil, 1 c water. Mixed, baked, & cooled. POKED & Cream of Coconut (Roland brand) heated a little and poured on. use only: 4 egg whites, 1/8 salt, 1/2 tsp vanilla extract, 3/4 c sugar, 1/4 c dark Karo syrup. Whisk in vanilla & then continue to whisk & heat over hot water (doubleBoilerStyle) until the whites are hot to the touch. Beat till room temp & thick. 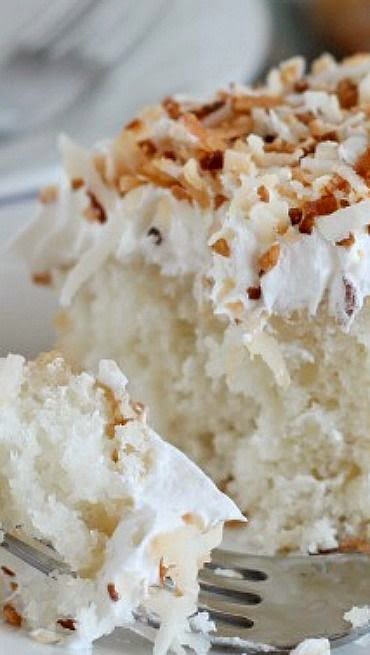 Frost the cooled coconut cake. Top w/soft UNtoasted coconut.